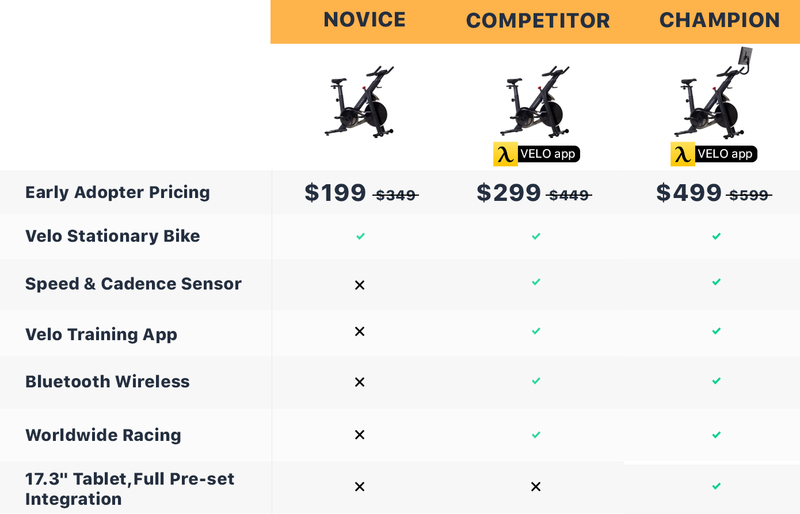 Velo is a sleek, affordable stationary bike that helps you use friendly competition to smash your fitness goals. Ergonomic, robust design meets software that enables you to race against anyone, anywhere in the world. Would you recommend VELO to a friend? Charles CôtéAspire to make a difference! Combines my two loves - gaming and cycling! Nothing glaring i can see yet! It will be a great way to stay fit in the winter when its too cold/icy to go for big bike rides. Charles Côté has used this product for one month. @chitran241 Looks cool, but also reminds me a lot of Peloton. What makes Velo different? The idea's not 100% new but Especially with the price they offer, I think Velo will be a hit. @d_qu_c_d_t thanks! agree that the concept is not absolutely novel. But either we think that there is anyone dealing with leveraging competition nature of humans to push exercise motivation in the market. From the standpoint of start-up people who are hungry for success and better ourself everyday, we hope that this can help us to be both productive and healthy. I’m sure I saw Velo on producthunt about a month ago? I liked the idea, now it seems you’ve come back with a totally new design. Why’s that? @kev9203 hey thanks for being interested in Velo. Basically if you love healthy competition, the Competitor and the Champion are made for you. Select the Champion if you don't want to deal with the hassle of downloading the app. If you're fine with your own tablet (or phone), Competitor is good to go. Check the table below to see the differences among three models. This product is perfect for who can't find the time or motivation to go the gym, or don't really know where to start to get fit. I don't think i'd buy one, but it will be great for my wife who's a stay at home mom.